In contrast to the traditional meshed-based methods such as finite difference, finite element, and boundary element methods, the RBF collocation methods are mathematically very simple to implement and are truly free of troublesome mesh generation for high-dimensional problems involving irregular or moving boundary. This chapter introduces the basic procedure of the Kansa method, the very first domain-type RBF collocation method. 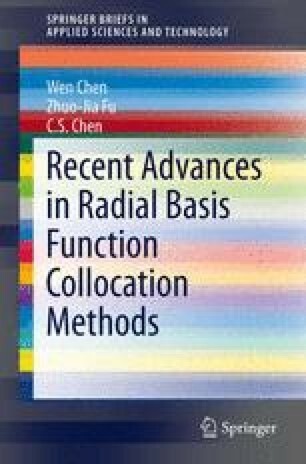 Following this, several improved formulations of the Kansa method are described, such as the Hermite collocation method, the modified Kansa method, the method of particular solutions, the method of approximate particular solutions, and the localized RBF methods. Numerical demonstrations show the convergence rate and stability of these domain-type RBF collocation methods for several benchmark examples.